I recently had a chance to sit down with my good friend Bradley Cook and all I have to say is that it was a rather exciting chat! If you don’t know who Bradley Cook is, he is an engineer who’s worked with countless amazing artists, including Foo Fighters, Queens of the Stone Age, Counting Crows, Isaac Hayes, Ben Harper, Fishbone, and Everclear. New Course Alert: New Bradley Cook Course is available on pre-sale today for only $47! He calls Barefoot Recording a home away from home, having worked there on and off since the studio’s renovation and rebranding in 2000. Bradley assisted Eric Valentine on projects over the years, while also venturing off on major projects of his own at various studios—notably Grandmaster Recorders, which was unfortunately sold for redevelopment nearly two years ago. Bradley brings 30 years’ experience as an audio engineer to the table, and his résumé speaks for itself! 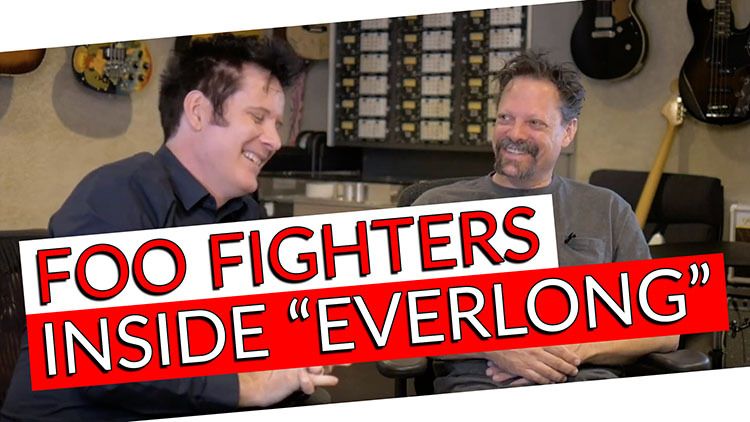 We discussed the Foo Fighters song “Everlong” which, incase you don’t know, was one of the biggest songs of the ’90s. I remember in Los Angeles, there was a time when you would turn on KROQ-FM and you would hear this song five or six times a day well past the time that it was in the charts. – It’s a staple of indie rock and an absolute classic. We were lucky to be able to have some of the elements to listen to during our chat, this is very very exciting! This song was recorded at Grandmaster Recorders in Los Angeles, CA. Foo Fighter’s second album, The Colour and the Shape, was primarily recorded at Grandmaster by Bradley, alongside producer Gil Norton. The first sessions for the album took place at Bear Creek Studios in Woodinville, Washington, which proved to be a less than fruitful experience. Bradley recalls trying to edit drums with Gil Norton, and struggling through the process. By the time the tracks got back to Los Angeles, it was evident that they should be re-recorded. Drum re-dos were handled by Dave Grohl at Grandmaster. For this album, Bradley and the band were recording while finished tracks were being mixed by Chris Sheldon. Tracks “hot off the machine” were sent down the street to Skip Sailor Studios to be mixed. At one point, if the mixing team had a suggestion—for instance, additional chorus guitars on “Monkey Wrench“—the tracks would be sent back to Bradley for overdubs, and back once more to Skip Sailor Studios. It was practically an album assembly line! Dave Grohl allegedly wrote “Everlong” after breaking up with his first wife. Grohl had the opening riff already written and finished the song on a trip back home to Virginia for the holidays. At the time, he had recently split from his wife and fallen for another woman, Louise Post of the band Veruca Salt. Her vocals can also be heard on the song, humming along to the riff and harmonizing the chorus. The band recalls the song’s success as a slow build. Before “Everlong” became the iconic tune that it is today, the Foo Fighters thought it was just another song. Frontman Dave Grohl “knew it was a cool song, but [he] didn’t think it would be the one song by which most people recognize the band.” Drummer Taylor Hawkins recalls Grohl’s acoustic version for Howard Stern initially getting more traction than the album version. It had to go through several stages before it really bloomed into a definitive Foo Fighters hit.